I modified the German designed Laser TX to drive a 1W Golden Dragon LED. 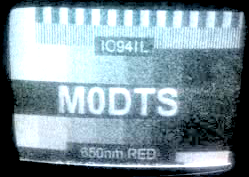 Managed to receive my own transmission at a portable site 11km away using the German designed Photodiode Rx at 20MHz, results were not that good, sync to weak lock of the video signal. This time i used a photomultiplier tube as the receiver and it worked much better! The TX alignment was not optimised in beam heading because i set this before going /p! Tx 20MHz carrier FM ATV to 1W LED and 30cm Fresnel lens. Rx Photomultiplier tube into into a 20 > 70MHz converter, then into a Zeta 1000L sat receiver.